Construction of the Great Cathedral of Sevilla was started in the 15th century. Those who built it wanted it to be a monument to the reconquest of Spain and so built it big - it is the third largest in the world, exceeded in size only by St. Paul's in London and St. Peter's in Rome. Sevilla was the headquarters of the conquest of the Americas in the 16th century. 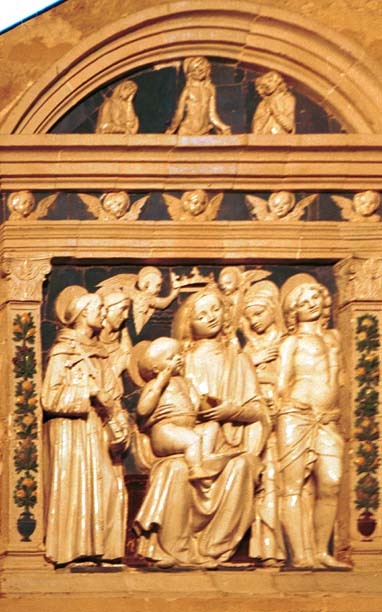 The remains of Columbus are buried in the Cathedral in a sarcophagus held aloft by four statues of men representing the four Kingdoms of Spain. We saw a marker in the floor identifying Columbus's son. We also visited the treasury and saw a silver reliquery nearly two meters high only taken out for special occasions. 2000 was a Jubilee year, and a huge platform inside the Cathedral anticipated a visit from the Pope later that year. The scale of the Cathedral is truly impressive, with tall, tall ceilings. This organ was one of many occupying "niches" in the Cathedral. 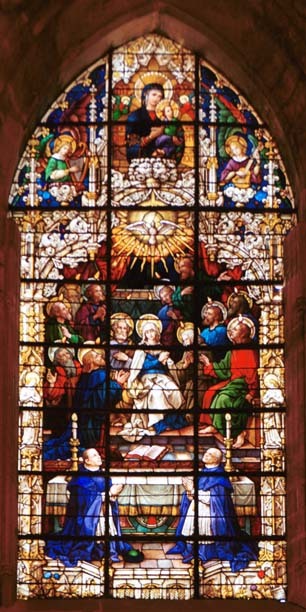 This stained glass window is one of many in the Cathedral, some dating to the 15th century. This bas relief was high on a wall. The patio of orange trees is right outside the tourist entrance to the Cathedral. The design, including the drains arrayed from tree to tree across the patio, recalls the Mesquita of Cordoba.